Hangzhou, China, 6 September, 2016 - Alibaba (Australia) Company Pty. Ltd., a member of Alibaba Group Holding Limited (NYSE: BABA), and the Australian Trade and Investment Commission ("Austrade") signed a strategic collaboration agreement today to strengthen trade opportunities by expanding the variety of Australian products sold to some of Alibaba's hundreds of millions of Chinese consumers through Alibaba's e-commerce platforms. 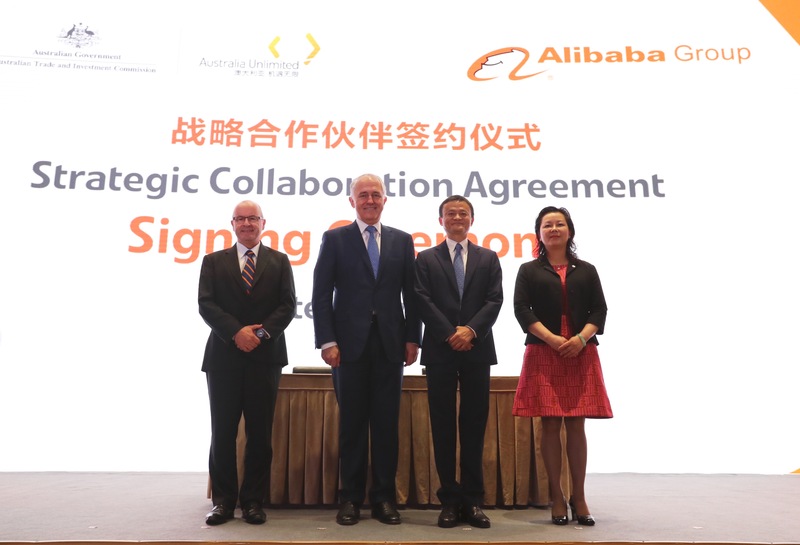 The agreement aims to broaden Alibaba's existing partnership with Austrade by providing dedicated services for Australian products and leveraging digital content to build brand Australia abroad. The signing of the agreement was witnessed at a ceremony at Alibaba's corporate headquarters in Hangzhou by Australian Prime Minister, Malcolm Turnbull, and Alibaba Group's Founder and Executive Chairman, Jack Ma. Prior to the signing of the agreement Jack Ma, Executive Chairman and Founder of Alibaba Group said, "the next chapter of trade between China and Australia will require closer cooperation and this agreement provides a new framework to ensure more businesses, especially Small and Medium Enterprises, can benefit through the partnership between Austrade and Alibaba. Together we can all work jointly to support Australian jobs and shape a new future for many people and businesses through the cooperation forged today." Speaking during his visit, Prime Minister Malcolm Turnbull said Alibaba "enables the smallest businesses, the mom-and-dad businesses, in the regional part of Australia to have access to the biggest part of the world, something that hitherto only a very large company with enormous resources, with enormous representation would be able to do. It's a liberating force for small business. And because so many of the services are available on the cloud, again it reduces the cost of business and levels the playing field between the big company and the small company." On signing the agreement with Austrade, Maggie Zhou, Managing Director of Australia and New Zealand for Alibaba, said, "Australia is a key market for Alibaba Group and we are excited to extend our collaboration with Austrade to cultivate successful Australian exporters that are capitalizing on China's expanding middle class. With Alibaba Group's new Melbourne office opening later this year, our local team will be dedicated to providing businesses with the information and tools they need to advance their international growth." The businesses to be explored by Alibaba and Austrade under the strategic collaboration are wide-ranging but a key highlight is the introduction of an annual "Australian Fresh Food Week" sales promotion and education event on Tmall Fresh, Tmall's fresh food channel, advancing the interests of Australian companies that exports dairy, meat, seafood, fruit and other fresh produce. Michael Clifton, Senior Trade Commissioner of Austrade, said, "Austrade's collaboration with Alibaba will allow more Chinese consumers to enjoy easy online access to a wider variety of Australia's premium products and fresh produce. Online delivery of imported fresh food in China is becoming increasingly viable as a result of improvements in last-mile cold chain logistics." Alibaba Group's mission is to make it easy to do business anywhere. It is the largest retail commerce company in the world in terms of gross merchandise volume. Founded in 1999, the company provides the fundamental technology infrastructure and marketing reach to help merchants, brands and other businesses that provide products, services and digital content to leverage the power of the Internet to engage with their users and customers.